Brighton Bathrooms specialise in professionally designed bathrooms and bathroom renovations. 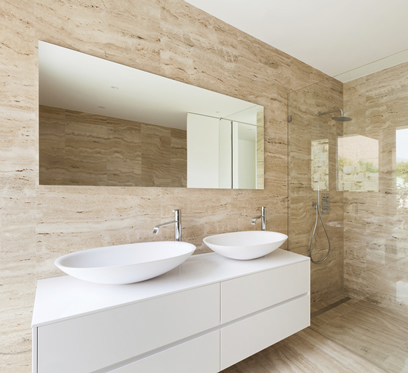 The right bathroom design will maximise your bathroom's potential and beauty. Brighton Bathrooms + Kitchens will design your bathroom with you - helping you with colour selection, bathroom furniture, fixtures and bathroom accessories to ensure a quality and stylish bathroom renovation. Brighton Bathrooms + Kitchens will remove your existing bathroom and install your brand new bathroom with the least possible disruption. Using modern neutral colour tones, elegant bathroom fixtures and special features can create a calming effect and luxurious ambience, resulting in your renovated bathroom becoming a soothing refuge where you can relax after a busy day. Brighton Bathrooms + Kitchens can install elegant fixtures such as vanities, tapware and towel rails - ensuring your bathroom renovation achieves the look and feel you hope to achieve, as well as the space needed for you and your family to function with ease. Brighton Bathrooms + Kitchens can also install modern special features such as wall niches, luxurious free standing bathtubs, elegant frame-less or semi-frameless shower screens. See our Special Features page for more ideas.